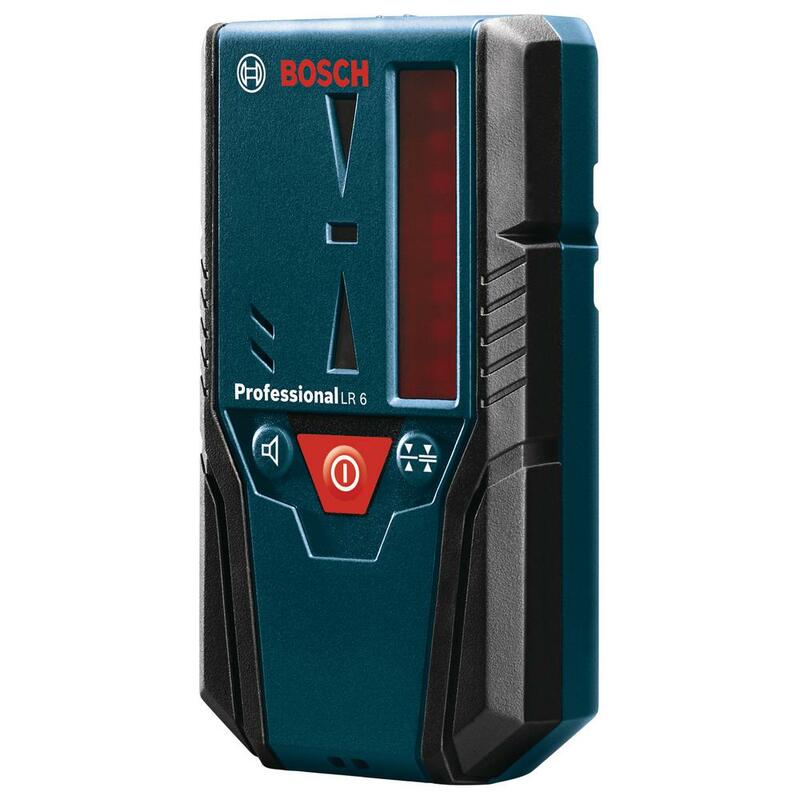 The folks in blue packed a lot of features into the compact Bosch GLL3-300 laser level. The feature that first grabbed my attention was the ability to shoot three lines simultaneously. After powering up the laser, it’s fast and easy to cycle through the various line options. It starts out with a horizontal line. Press the mode button once, and the horizontal line disappears, replaced by a 360° vertical line extending sideways from the laser. Another press adds a second vertical line, at a 90° angle to the first. Hit it again, and your horizontal line returns to join the party. The Bosch GLL3-300 laser level offers two operating modes: locked (manual mode) and unlocked. Sliding the power switch to the first ON position puts the unit in locked mode. This is useful for establishing lines on a non-level surface, for setting the height for a handrail on stairs, or the slope for waste pipes, for example. 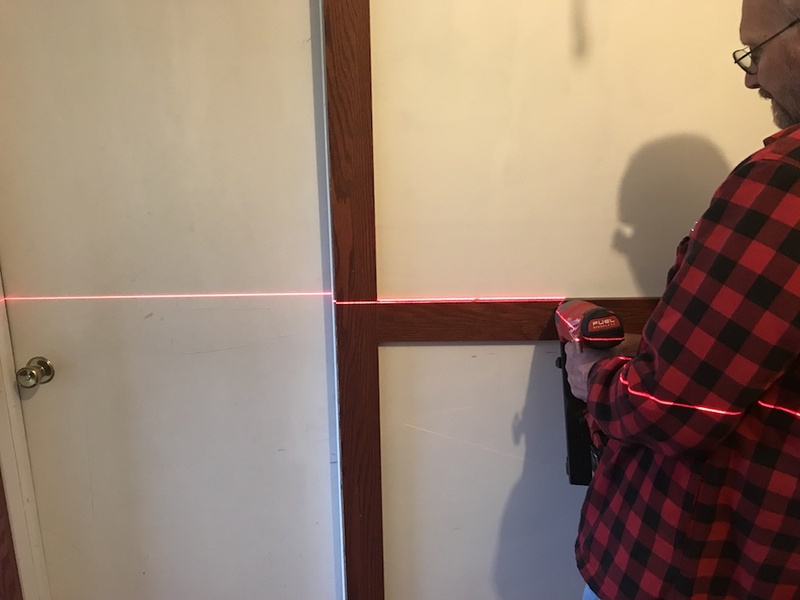 The laser line can be locked in at any angle. Sliding the power switch to the second position puts the Bosch GLL3-300 laser level in Automatic Leveling mode. In this mode, the level should be set up as close to level as possible, and it will compensate for out-of-level conditions of plus or minus 4°. If it’s not within that range, you’ll know it – the laser lines will be flashing quickly, accompanied by a high-pitched beeping. As soon as the level is within its 4° happy place, the lines go solid, and peace is restored. If the level gets bumped out of whack, the flashing and beeping resume, alerting you to your clumsiness. The Bosch GLL3-300 laser level has an operating diameter of 200’. That’s a pretty impressive range. For those working on large commercial buildings, or working outdoors in brighter light, Bosch offers a way to get even better range and performance. Using the optional Bosch LR6 or LR8 Laser Receiver, the operating diameter can be extended up to 300’. An optional receiver extends the laser’s range, and helps track the beam in bright light. The GLL3-300 has a switch that sets the unit to Receiver mode, indicated by a green light under the little receiver symbol. This causes the laser lines to flash at a very high frequency, so they can be detected by the laser receiver. The receivers can detect the laser light even in bright light – and without using those sporty red laser glasses! 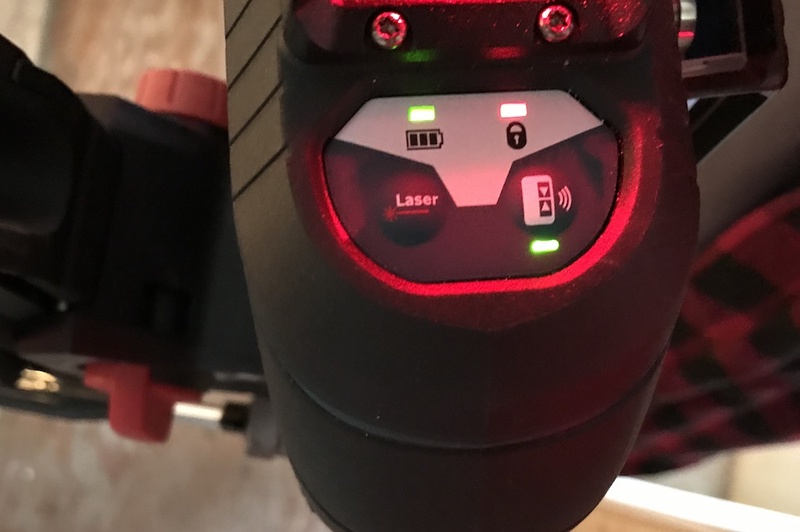 Note: When the unit is in Receiver mode, the laser lines are less visible to the naked eye, so switch back to normal mode when you’re not using the receiver. The Bosch GLL3-300 with its receiver mode activated. The Bosch GLL3-300 laser level is a precision instrument, and Bosch designed it with an eye toward survival in real-world conditions. The unit is covered by a rubber overmold, giving it IP54 protection from dust and splashed water, along with a bit of cushioning. If (when) it does get knocked over or dropped, the manual provides instructions to check it for accuracy. If it gets knocked out of whack, it’s off to the service center. The Bosch GLL3-300 Laser Level comes with a great accessory to help position the level wherever it’s needed for the current mission. The Bosch BM1 positioning device can be hung from a wall or stud using its keyhole slots, or stuck to a metal surface with its beefier-than-they-look magnets, which even have a V-groove to keep the unit stable on rounded surfaces. 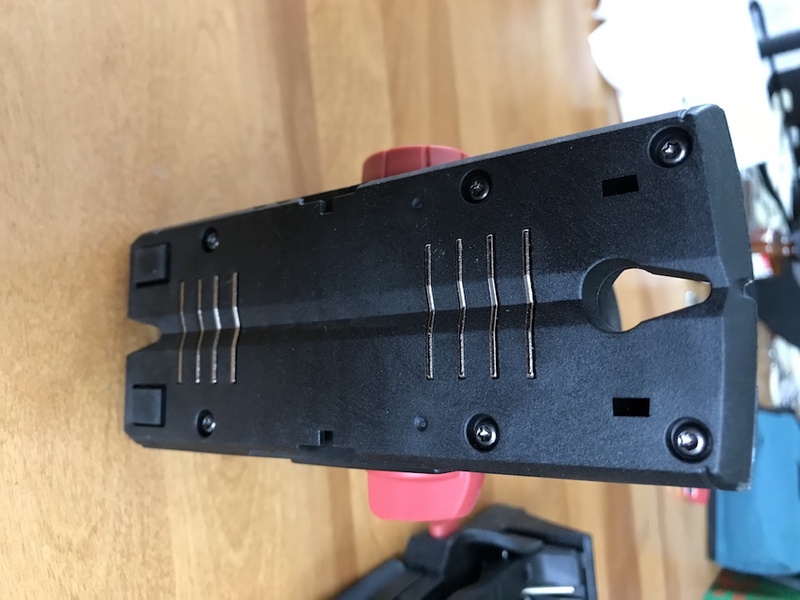 There’s even a slot through the back portion of the BM1, so you can strap it to a post or whatever, with optional hook-and-loop strapping. The Bosch BM1 positioning device is included with the Bosch GLL3-300 laser level. Mounting options include keyhole hanging slots and a series of strong magnets. 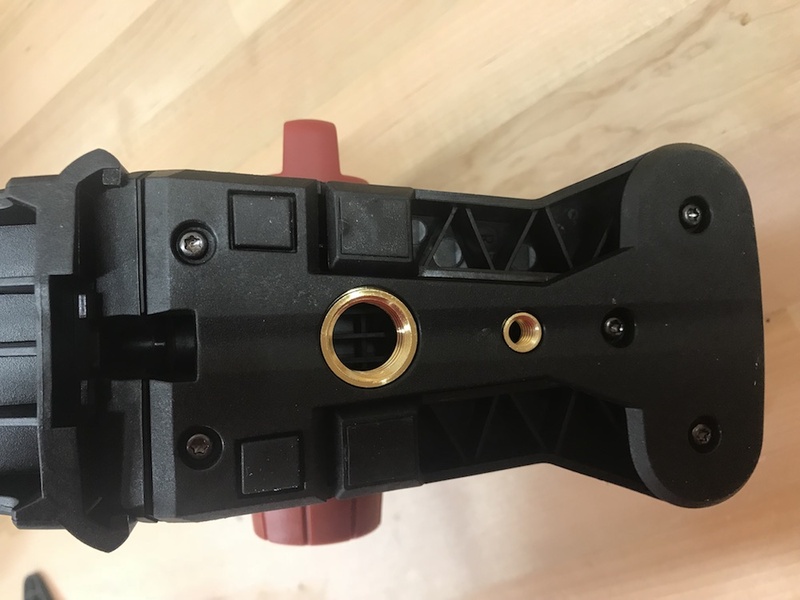 Also included on the Bosch BM1 are threaded ¼-20 and 5/8-11 mounts on the bottom of the unit, making it easy to mount the BM1 on a standard tripod. A large knob makes it easy to attach the laser level to the BM1 positioning device. Swing out the BM1’s little lunar landing module feet, and you can place the unit on any stable horizontal surface. The BM1 also has a clamp that allows the laser level to be attached to a suspended ceiling grid, or other narrow surface. There’s even a spring clip to dangle it from suspended ceiling gridwork. Once the Bosch GLL3-300 Laser Level is mounted on the BM1, it can swivel a full 360º, and the horizontal line extends full circle. When the laser level is close to the target height, a micro-adjustment dial allows a few inches of up and down fine tuning. A microadjustment dial lets you fine tune that fine line. Getting the Bosch GLL3-300 laser level into action is easy. Pop off the battery cover, insert the four included AA batteries, replace the cover, and hit the power switch. 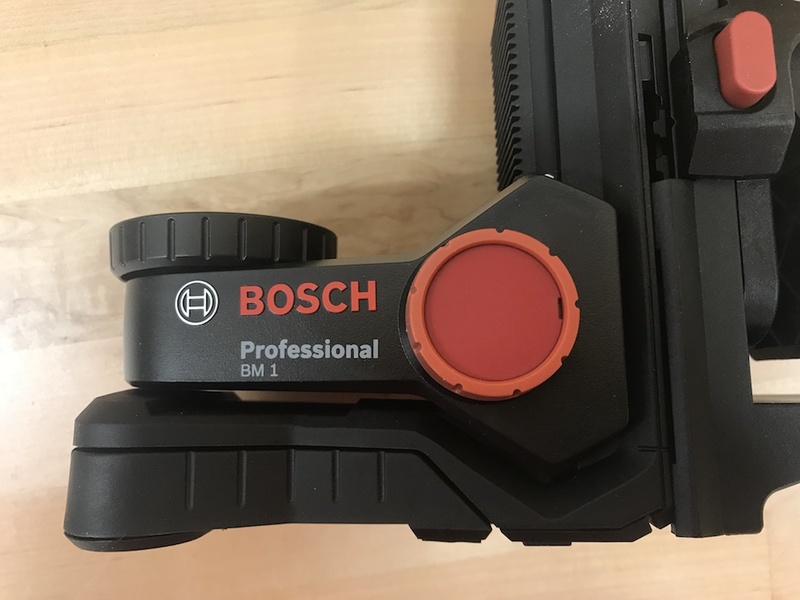 I was a bit surprised at Bosch’s decision to go with disposable AA batteries, rather than setting it up to use their 12V or 18V rechargeable platforms. Pro users may be annoyed at having to worry about keeping fresh AA batteries on hand. 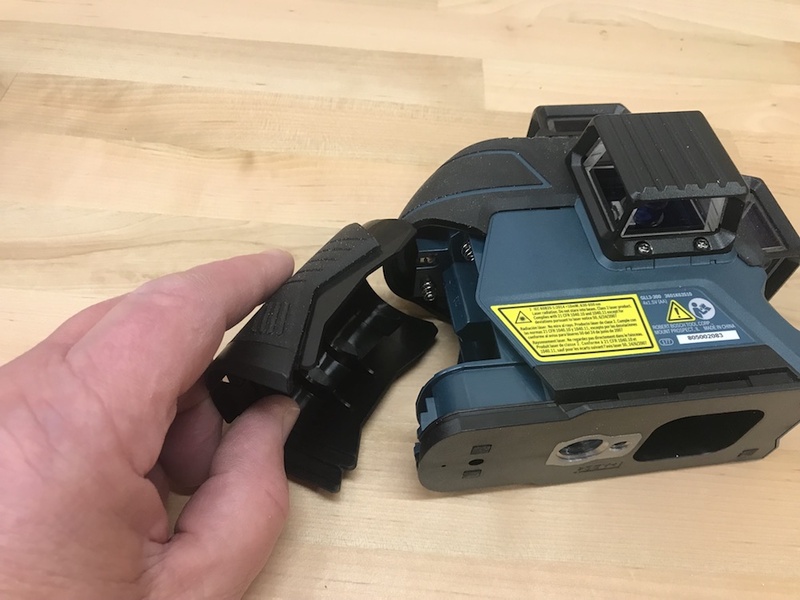 However, using the smaller AA batteries allowed them to make the unit a bit more compact, and the laser level’s VisiMax technology wrings a good bit of life out of the batteries. I set the Bosch GLL3-300 laser level up in several locations, both indoors and out. 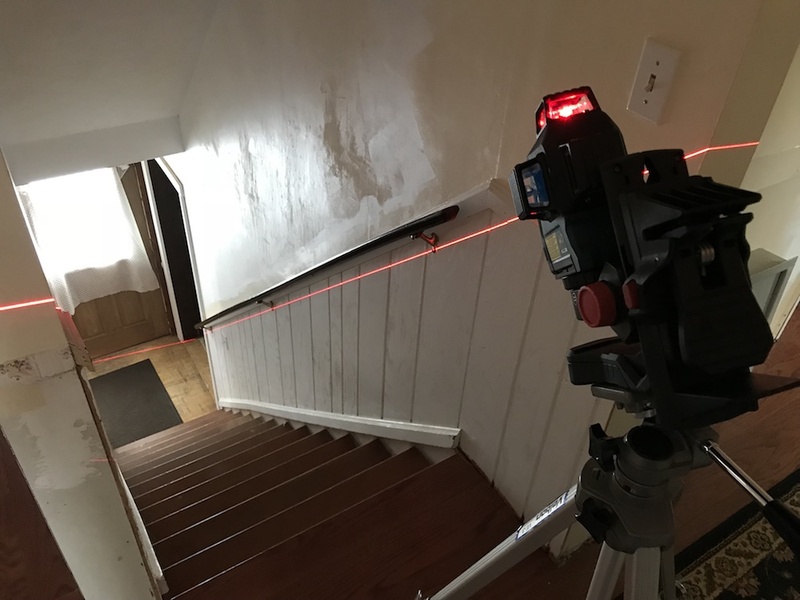 With the laser locked, it projected a line perfectly parallel with the slope of a stairway. The 360º horizontal line worked great to give a fast, consistent, level line for installing trim at chair-rail height. 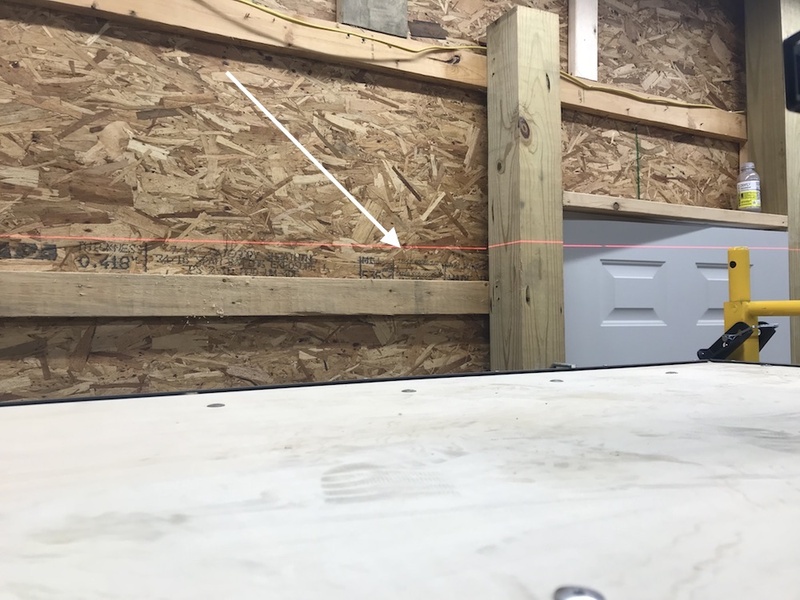 Something to note, especially if you’re working in a large room with walls at varying distances: Since the width of the laser line can vary with distance, always use the center of the line to make your marks. Getting a consistent trim height is easy, since the Bosch GLL3-300 hits multiple walls. A nice, easy-to-follow path, and no chalk to clean up. 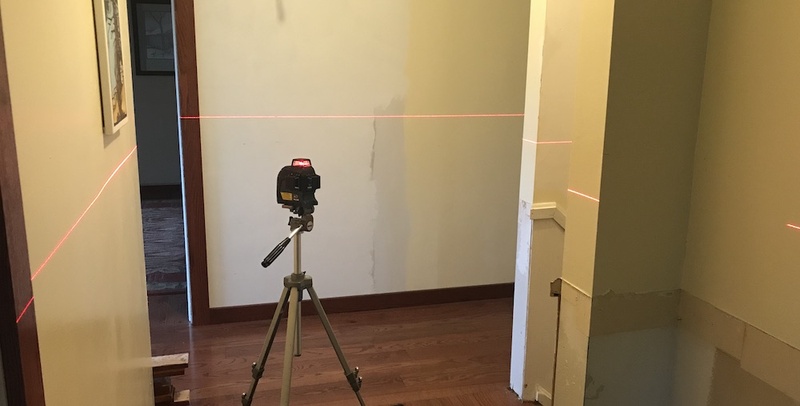 The lines projected by the Bosch GLL3-300 laser level were easy to see indoors. This was especially true on white walls, even in a well-lit room. 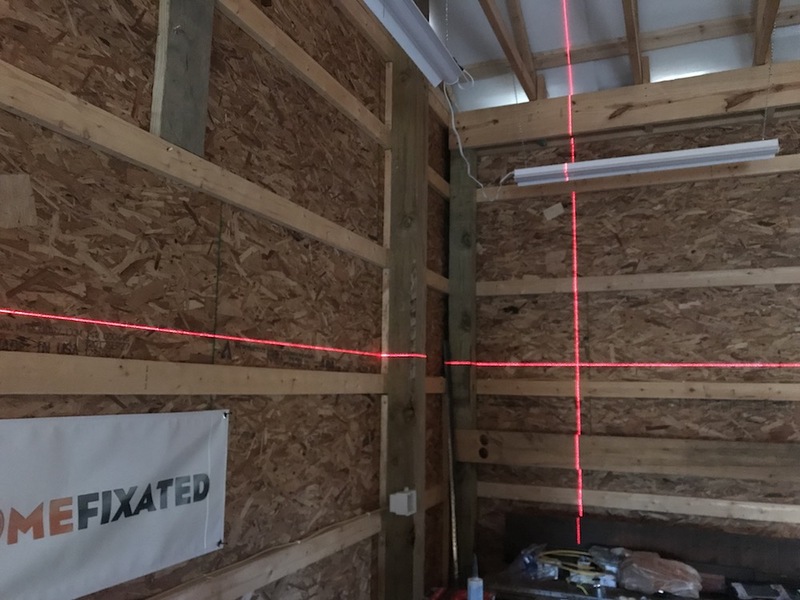 In my shop, the laser projected nice, bright lines on all four walls; that will speed things up shortly, when I start installing shelving on the walls. Visibility was very good in the shop, especially with the lights out. The lines were not as bold and bright, but still plainly visible, even when I fired up my roughly 25 LED shop lights. Even with a LOT of LED lights on, the lines were still clear and crisp. Outdoors, the lines from the Bosch GLL3-300 weren’t quite as easy to spot. This is the nature of the beast; the thin line of light produced by laser levels tends to wash out in bright light. It was very difficult to see on a sunny day; overcast days are somewhat more laser-friendly. 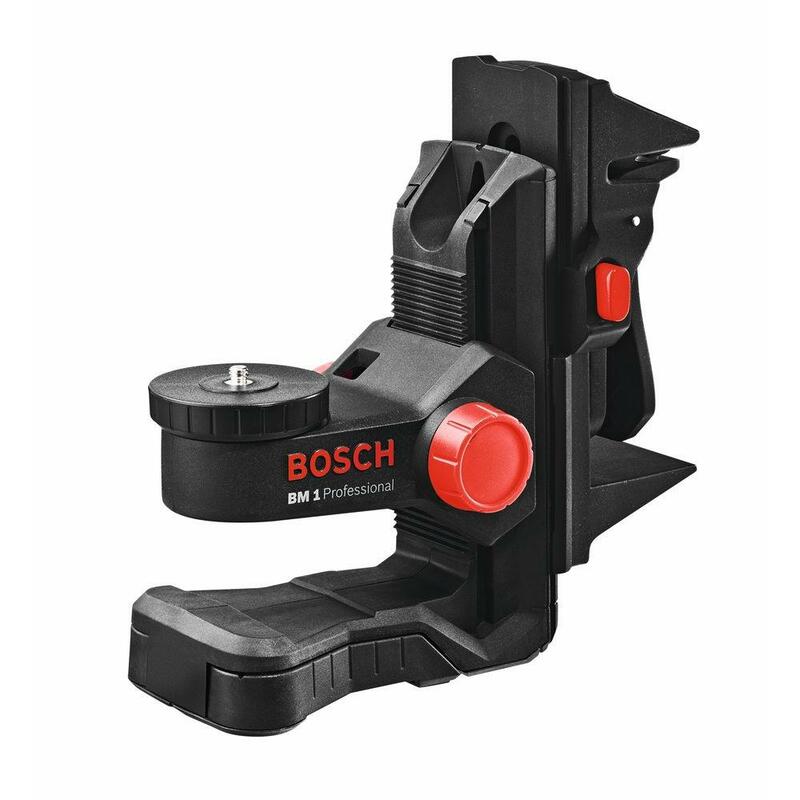 Users planning lots of outdoor leveling projects may want to invest in one of the Bosch receivers, especially for projects where the beam will be used over fairly long distances. Some users may also find red laser-enhancement glasses helpful. Something to be aware of, for any first-time laser users: The light from ANY laser, including laser measuring devices, is not eye-friendly. Never look into the light from this or any laser, and never point it at anyone. This can be especially tricky to manage with a laser like the Bosch GLL3-300, with lasers seemingly beaming out of every pore. Just be aware, and keep your eyes averted. And by the way, laser enhancement glasses do NOT offer protection from the light (hence the name “enhancement”). Many of my tools don’t lead a very cushy life. Circular saws, hand tools, even impact drivers and drills, often get moved from point A to point B in a jumble in the back of the truck. And that’s as it should be – they’re here to work, dammit! Other tools, though, need a bit more TLC to keep them from becoming expensive doorstops. That category includes box beam levels, digital tape measures, work lights…and laser levels. The Bosch GLL3-300 Laser Level is fairly ruggedly built, but when it’s not on the job, it needs protection. Ideally, a hard case with a fitted foam insert. The unit comes with a soft case, with just enough room for the laser itself. It’s a well-made case, but it’s just canvas, so it won’t provide much protection from getting banged around by other tools in the back of the truck. 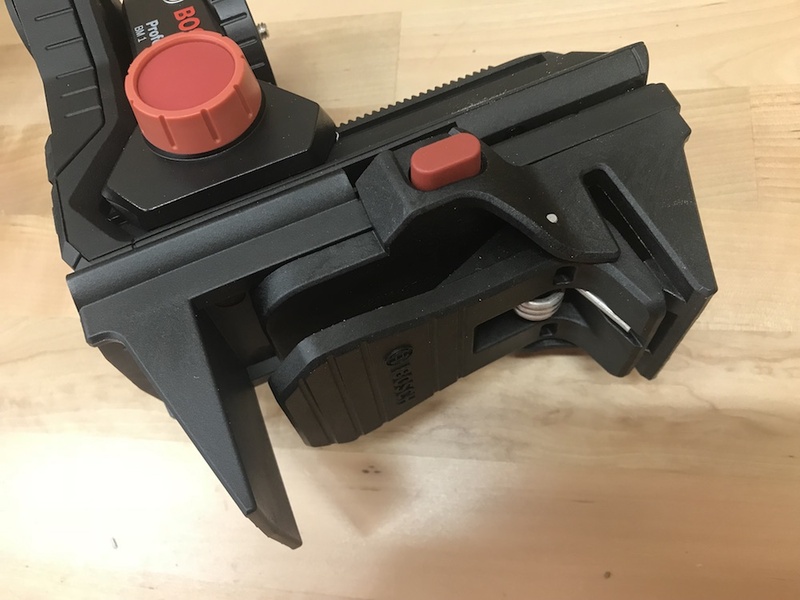 It also has no room for the BM1 mounting base, or any other accessories, so you’ll need to find a way to keep everything corralled together. 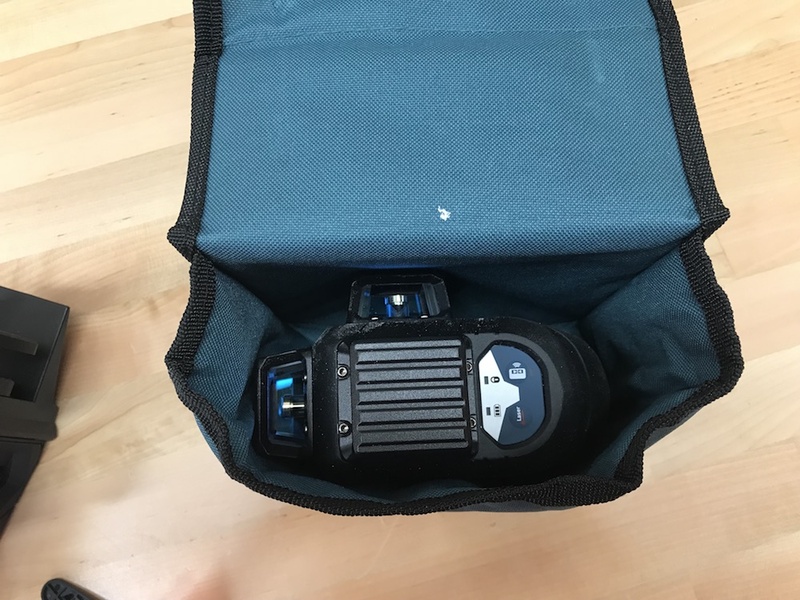 The included pouch has just enough room for the laser. 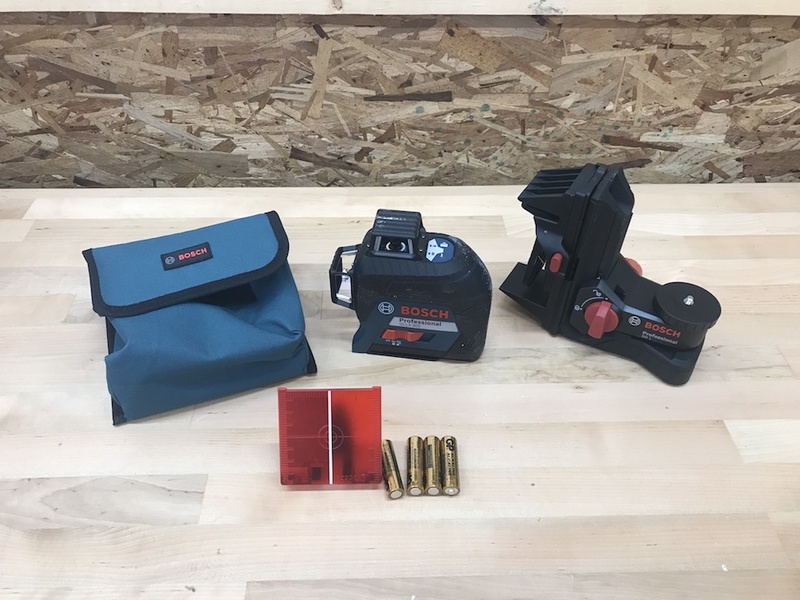 When I received the unit, the product page for the Bosch GLL3-300 Laser Level stated that it came with both a heavy-duty pouch and a hard carrying case. I contacted Bosch customer support, and after a bit of back and forth was told that the description was incorrect, and that no hard case was included. (Note: The product description on the Home Depot product page is correct). I was told they would update their specs on the web site, to avoid future unhappy consumers. As of this date, several weeks later, it’s still there. C’mon, Bosch support peeps – fix it. Better yet, include the case! Meanwhile, I plan to buy one to protect my tool and accessories, and I recommend you do the same. Laser levels get called on to do a wide variety of tasks. Plumbers, masons, framers, tile setters, and finish carpenters are among the trades that benefit from the ability to get a fast, precise layout. Even serious DIYers and homeowners are increasingly using them to get their projects squared away. 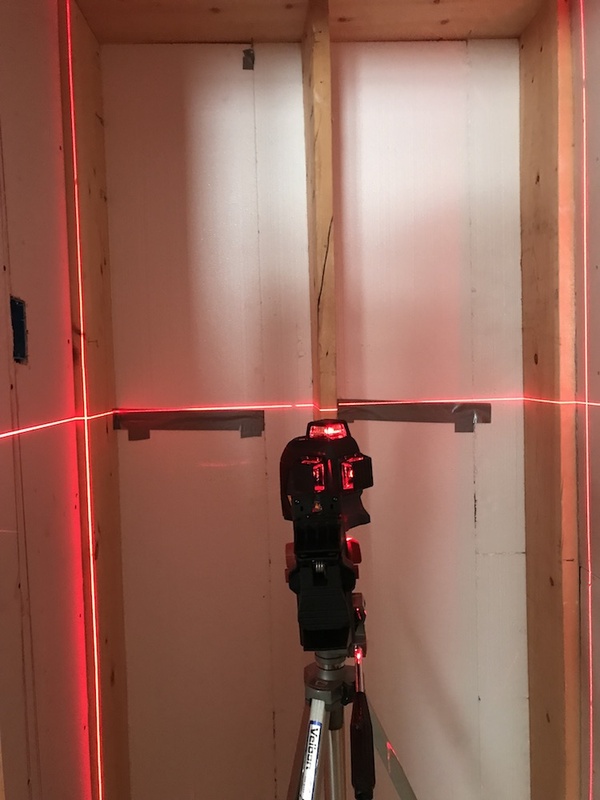 Laser levels are great for installing chair rail and crown molding, or even just to get a nice, even row of pictures on the wall, even going up a set of stairs. The Bosch GLL3-300 laser level is a well-made, compact, very versatile tool. Its ability to project one, two or three level and plumb lines will be a big time save for anyone having to square up a room, or do various types of finish work. The inclusion of the Bosch BM1 positioning device is a nice added bonus. The Bosch GLL3-300 kit has everything you need to get squared away. The Bosch GLL3-300 Laser is covered by a one-year warranty, which Bosch will double if you register the tool within eight weeks of purchase. 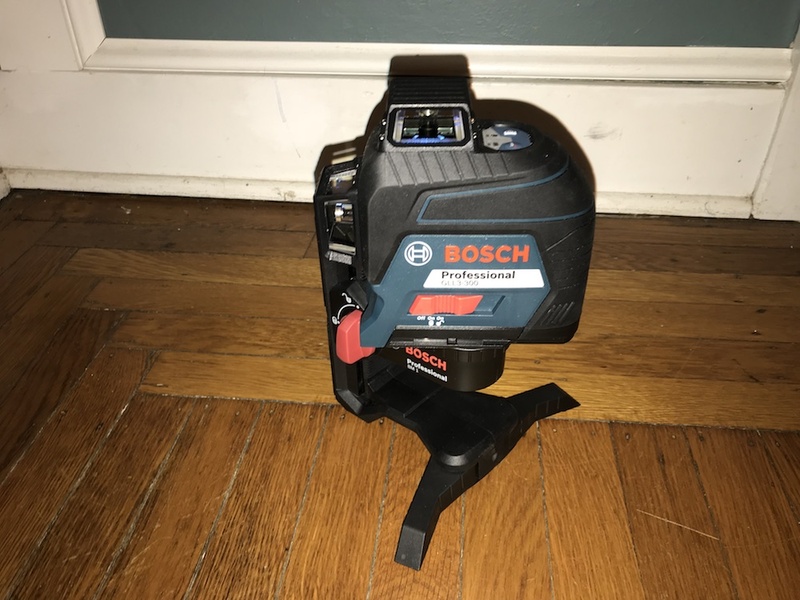 Bosch also offers a 30-day no-questions-asked refund or replacement on the tool, and if you buy it from the Home Depot, you get 90 risk-free days to get your world squared away.